This walkthrough uses the StoreSummary table from the Reels database. By default, in ActiveReports, the Reels.mdb file is located in the [User Documents folder]\GrapeCity Samples\ActiveReports 12\Data folder. In the New Project dialog that appears, select ActiveReports 12 Page Report Application and in the Name field, rename the file as rptCompositeChart. In the DataSet Dialog that appears, select the General page and enter the name of the dataset as StoreSummaryData. In the Report Explorer, select Report and in the Properties Window, set the PaperOrientation property to Landscape. In the Select a Chart Type wizard that appears, select the chart type as Column and go to the Properties Window to set the following properties. Double-click inside the chart area to display the chart panes along the top, right, and bottom of the chart to drop fields in. 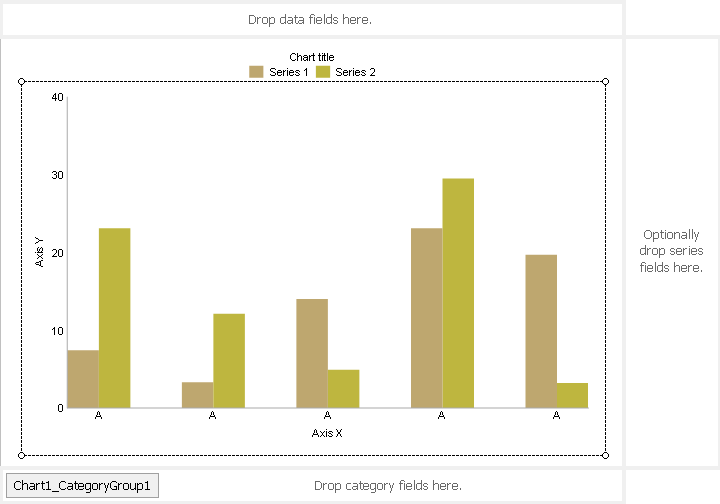 From the Report Explorer, drag the StoreName field into the area below the chart labeled "Drop category fields here." This automatically binds the StoreName field to the X-axis. Select the chart and at the bottom of Properties Window, select the Chart Y-Axis command. In the Y-axis dialog that appears, under the Title tab, set the Y-Axis title property to Gross Sales. Click Add to add the second Y-Axis. Set the Y-Axis title property to Gross Profit and the Margin property to 0.8in. Click Add to add the third Y-Axis. Set the Y-Axis title property to Total Items and the Position property to Right. Select the chart and from the bottom of the Properties Window, select the Chart data command. Select the Series Values page. Click Add to add the first Y-axis series and set the properties as follows. Click Add to add the second Y-axis series and set the properties as follows. Click Add to add the third Y-axis series and set the properties as follows. 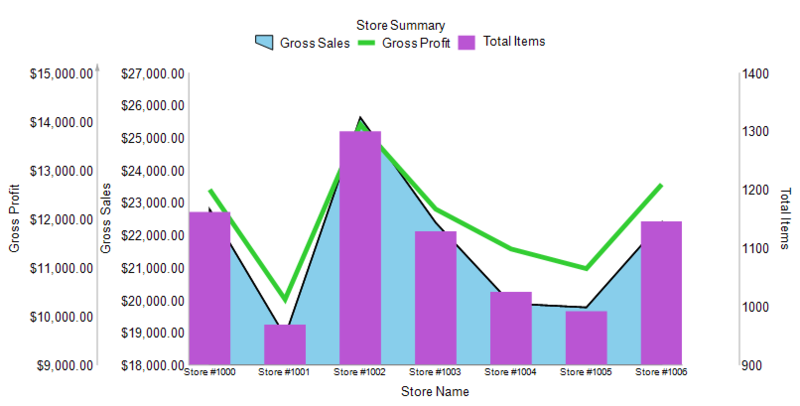 Select the chart and at the bottom of Properties Window, select the Chart appearance command. 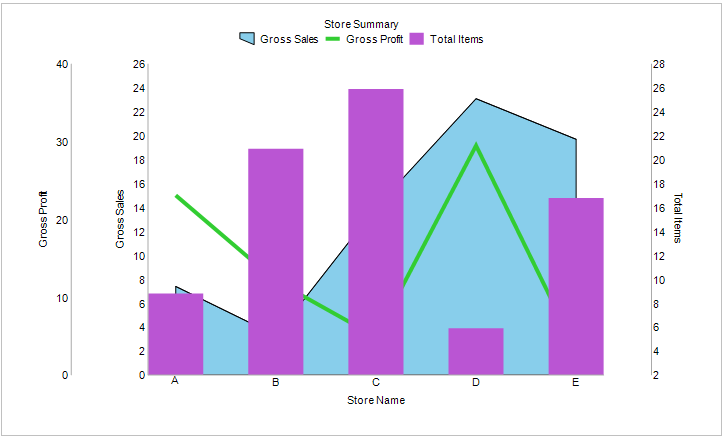 In the Chart Appearance dialog that appears, on the Title page enter Store Summary in the Chart title field. In the Palette page, open the Palette drop-down, and select Pastel. Select the chart and at the bottom of the Properties Window, select the Chart X-Axis command. 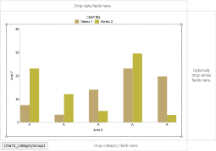 In the Chart X-Axis - Title dialog that appears set the properties as follows. Select Y1 from the list of Y-axes and under the Labels tab, select the Show y-axis labels check box. Also, select Currency from the Format code drop-down. Repeat the above step for Y2. Select Y3 from the list of Y-axes and under the Labels tab, select the Show y-axis labels check box.